Tell us about Vedam's commercial outcome? Vedam was made on the limited budget because lot of stars compromised on their remuneration. Hence it was a very good profitable film. I made a fortune because I didn’t take remuneration, but shared the profits. Allu Arjun compromised on remuneration and shared profits. If you combine his compromised remuneration and shared profit, it is much more than what he charges for a full-length commercial films. This fact was revealed by Allu Arvind during filmfare function in which Vedam won. Gap between the release of Vedam and KVJ? After Vedam got released, I penned two stories simultaneously - one is Shivam (Mahesh Babu) and the other is KVJ (Rana). Both these scripts were written by keeping these particular heroes in mind. Mahesh Babu has other commitments to finish before shooting Shivam, hence I have decided to make KVJ first. My earlier film Vedam was released in 2010 and KVJ is releasing in 2012. I don’t think it’s a huge gap. KVJ has 6-7 plots converging into one idea. It has different threads entwined and travel towards a core focus idea. Each and every character has a backstory to tell. All my films so far have been about redemption and human triumph. KVJ tells us that each person is a society himself with good, bad and ugly lurking inside. There are two types of anger. One is personal anger and other one is public (societal) anger. Personal anger is a selfish one and public anger has something to do about collective society. If Gamyam and Vedam deals about redemption, KVJ is a much larger than life picture that deals with public anger. KVJ a little loud film and a complete commercial entertainer. Swamy Vivekananda told that society is not going down because of the ability of evil people, but due to the inability of good and able people. This is the principle that applies to many films. KVJ film tells us that reacting to the public anger is much more useful than avenging for personal angst. The plot line of KVJ is about how a reluctant stage actor goes through motions while fulfilling the last wish of his grandfather to play naata roopakam Krishnam Vande Jagadgurum. While playing the KVJ play, the actor realises that KVJ is not about some grand story that happened centuries ago, but it reflects the happenings in our day-to-day lives. KVJ story is the convergence of lives of a theater artist, tribal people (exploited ones), mining mafia and media. What is the reason to cast Rana? Is it because he is a close friend? I invest in story, not on budget. I had Rana as hero while writing the script. It’s a full length power-packed action film. And Rana fits the bill to tee because of his action body figure. His looks and diction is what inspired me to select him. I know his talent. How did you bring Nayan Tara onboard? The first choice was Nayantara and when we approached her, she told that she stopped acting and Sri Ramarajyam was her last film. Then we had auditioned for 5-6 people. After four months, Nayantara considered acting again in films and accepted our offer. She adjusted her dates in bulk and made sure that we were prefered first as she immensely liked the script. I wanted a new age music for a story that talks about age-old concept of Krishnam Vande Jagadgurum. If you listen to Jarugutunnadi Jagannatam, you will understand how he mixed the new age music with the essence of KVJ. Jarugutunnadi is a mythological anthem. SPB voice adds magic to it. Jarugutunnadi... song will remain as one of my life’s greatest moments. Heard that you had problems with censor board? They opined that violence is overboard. Hence, we toned down the violence. If we have Narasimhavataram in the film, it has to be violent. We had audio cuts for words like Pudingi, Vitudu, Buffoon etc. I am an impatient movie viewer. I can’t sit through a film for more than two hours. Gamyam’s duration was 2 hours and Vedam’s duration was of 2:10 hours. 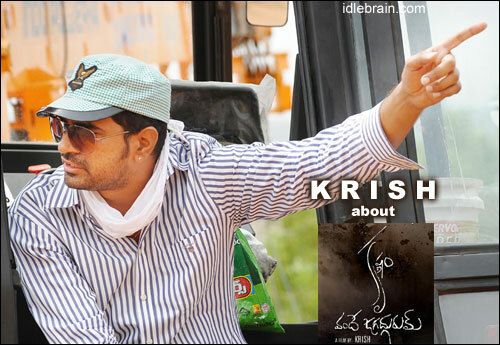 The runtime of KVJ is 2 hour and 10 minutes (first half is 1:08 hours and second half is 1:02 hours). We have shot the film in 79 working days. Tell us about cinematographer Gnana Sekhar? Gnana Sekhar is an extremely talented cinematographer. He has an art director in himself, thats why you can see aesthetics and right color sense in his films. During Vedam film, we had shot ‘Prapancham’ song using Panavision camera. I fell in love with that camera as it captured rich colors. We have used Panavision camera for the entire film though it’s very expensive. We had huge sets erected by JK Murthy and all the sets were beautifully captured by the Panavision camera. Since it’s about theater, you might have needed a crew that is different for the one working for commercial films? Yes. Thirumala is costumes chief who has worked for mythological/period films from Annamayya to Sri Ramarajyam. Chitturi Srinivas is the make-up chief. We had roped in the people of Surabhi (Surabhi Babji and Surabhi Nageswara Rao) for realistic effect. Lots of actors from Surabhi company also acted in KVJ. Tell us about other technicians? Shravan - the editor of this film is my first audience and he did a terrific job. Sai Madhav Burra is a great writer and he is a man to watch out for in future.Venkatesh Chakravarthy (dean of Ramanaidu Film School) is the script consultant. He has also donned the role of journalist Prasad in the movie. If you have to sum up KVJ? KVJ is a fresh action adventure commercial film. Watch out for a great talent called Rana! !